Using the New Signup API to Manage Your Leads and Deployments! Today, partners can use Trialforce to provision trials which is an easy and seamless way to turn prospects into paying customers. The new Signup Request API takes this functionality to the next level. Today, partners can use Trialforce to provision trials which is an easy and seamless way to turn prospects into paying customers. The new Signup Request API takes this functionality to the next level. It exposes a new SignupRequest object via the API and by simply adding records to this object, trials can be created. Since this is a standard object, it provides you with the full power of the Force.com platform. For example, it allows you to customize the signup process using workflows and track the status of trial signups. You can also run reports and analyze information on all signups, giving you more control over the signup process and visibility into your prospects. All of this is now possible with the new Signup API. 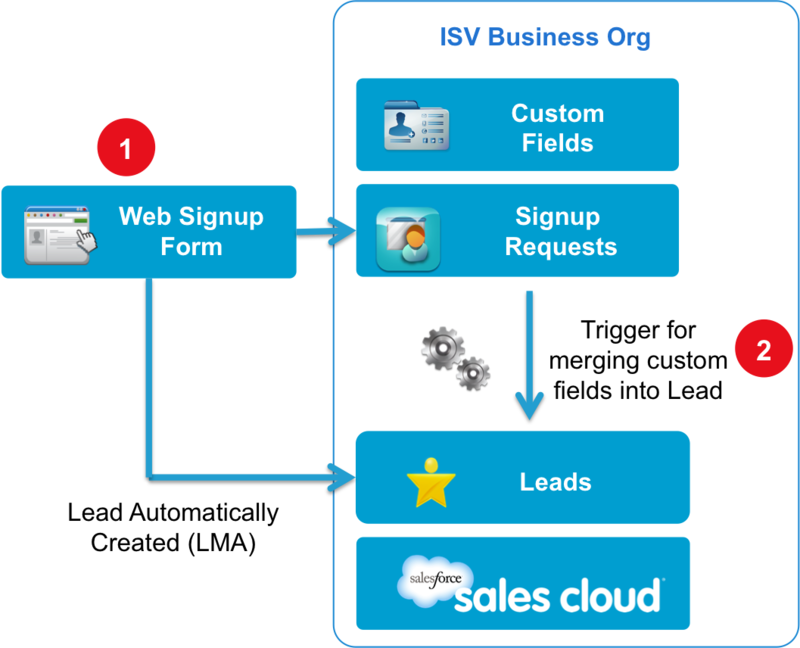 You can find more details about the Signup API in the ISVForce guide here. An additional benefit is that a partner can now capture more information from the user then ever before. The standard SignupRequest objects captures basic information about the prospect. You can customize the SignupRequest object to capture and track more information about prospects to create better leads. I’m going to show you how to do this in the rest of this blog. The ISV Business Org is the org you use to run all business operations. It is where you have CRM in addition to ISV Platform Technologies like Trialforce Signup Requests, the License Management App (LMA) and the Channel Order App (COA). It is important to have your org configured this way to get the most value out of these tools. How does the Signup Request API Work? First, a user fills out a lead form on your website. When the form is submitted, the standard Salesforce SOAP/REST API is used to create a Signup Request record in the ISV Business Org. The Signup Request will contain all the information you captured about the person who signed up for the trial as well as the desired trial template. Once the Signup Request is created, a new Trialforce org will be provisioned based on the specified trial template. The Signup Request status will update to “Success” when the org is ready and the confirmation email has been sent out. Capture the additional information in the Signup Request. Merge this information with the existing Lead created by the LMA. 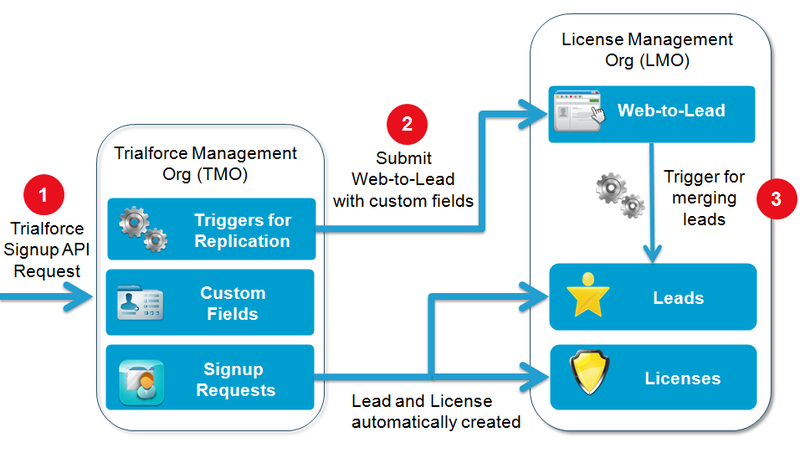 Enable the Signup Request API in your ISV Business Org. You can request this by logging a case in the Partner Portal. Create custom fields on the Signup Request object to capture the additional information you want to collect from leads. If needed, create custom fields on the Lead object to capture the additional information. Here is some sample code for the trigger to help you get started. Please note that this is boilerplate code that WILL NOT work unless you modify it to suit your environment. Once the Signup Request is successful, find the corresponding Lead and enrich it with the custom fields. That’s it, you’re done! This feature is available with the Summer ’13 release. You can view the summer ’13 release notes here. A special thanks to Naren Raghavan, Sebastiano Costanzo, Scott Effler and William Yeh, from the ISV Technical Enablement team, for putting together this documentation.